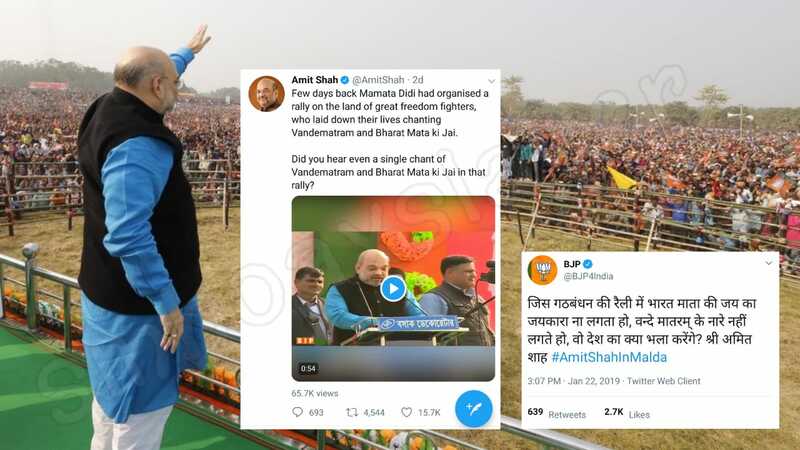 Amit Shah, BJP President in his 22nd Jan 2019 speech in Malda, West Bengal raised a doubt, asked a question if any opposition leader chant ‘Vande Matram’ or ‘Bharat Mata Ki Jai’ during the United India rally organized by West Bengal CM Mamata Banerjee on 19th January 2019 in Kolkata. His tweet with the question, till now had been retweeted by approx 4500 people. Few days back Mamata Didi had organised a rally on the land of great freedom fighters, who laid down their lives chanting Vandematram and Bharat Mata ki Jai. Probably Mr. Shah missed to listen to the leaders’ speech or he knew they won’t say. But, there were many incidents where leaders like Mamata Banerjee, Tejashwi Yadav, Satish Mishra, Hardik Patel, and Shatrughan Sinha chanted the patriotic slogan during the speeches. Mamata Banerjee, West Bengal Chief Minister ended her address with the chants of Jai Hind and Vande Matram. You can hear in the video below that Mamata Banerjee keep on chanting Jai Hind and Vande Matram from 25:25 to 25:40 minutes. Tejashwi Yadav, RJD leader also ended his speech with a patriotic slogan of Jai Hind. You can see in the video below that he raised the Jai Hind slogan at 6:30 minute. Hardik Patel, Patidar leader from Gujarat ended his speech with slogans of Jai Hind and Bharat Mata Ki Jai while addressing the rally. Here is the video where you can hear him chanting the slogans at 4:48 mark in the video. BSP leader Satish Mishra ended his speech with the slogan of Jai Bhim and Jai Bharat. You can watch the video below where he chanted the slogan at a mark of 4:00 minute. Shatrughan Sinha, BJP MP also joined the opposition rally and chanted the slogan like Jay Bengal and Jay hind to while addressing the public meeting. Viewers can see the video where he chanted Jay Bengal and Jai Hind at the end of his address at a mark of 14:18 minute. You can see the video below as he spoke about the spreading viral message whether it’s true or fake from 26:38 to 28:14 minutes. ← Is this old man, a suicide bomber ? The photo Pritish Nandy claimed as of Statue of Unity is False. December 10, 2018 Hoax Slayer Comments Off on The photo Pritish Nandy claimed as of Statue of Unity is False. Did Katju @mkatju said about shaving his head after poll results ?